Gratituesday: It’s (almost) FINISHED!!! And I’m Giving One Away! I am SO excited to tell you that the project I’ve been working on for hours and hours lately is ALMOST (but not quite) finished!!! The only pieces left are the final tedious editing and perfecting of details. In the meantime, I’ve decided that I’m dedicating this Gratituesday to tell you about it because seriously, you have NO idea how excited and thankful I am to be almost finished with this project and to almost be able to offer it to you! Many of you suggested that perhaps I was working on a book…not an ebook…but a book, book. Oh, how honored I was to hear you say that you’d be so excited if indeed I was working on a book! Thank you so much. That’s not what I’ve been working on, but someday…someday. It is a goal of mine…one I’ve shared with only a few people. But others in my life have encouraged it…and now you are encouraging it…so yes…someday. When God tells me that the time is right and when He opens all the right doors. Thank you so much for your encouragement. You truly humble me. What I HAVE been working on though is a little tool for you to use with your kids. And by little tool, I really mean a 240+ page tool. Not at all little, actually. I began this project back in 2008. I had the idea to share with you in ebook form something that had worked very well for us when we had a bunch of little preschool aged fellas running around. It was something that we came up with to help us teach our kids the preschool basics…but more importantly…it was something we did as a family to serve other families and individuals around the community. We focused on one alphabet letter each week and did all kinds of fun activities centered around that particular letter. But our main focus each week was thinking about people or families we knew whose name began with the letter we were studying. Toward the end of the week, we had a special surprise for several people. For instance, during Mm week, we delivered Mini Muffins to the Millers, to our friend Mark and to Mrs. Moses. We included a nice card explaining that they were a part of our Alphabet Blessings project and thanked them for letting us serve them. Usually we were all able to sit down and enjoy a nice visit together for a few minutes. It was a HUGE joy to do this as a family and we have so many wonderful memories of our years doing this with our little guys. It was, of course, also a wonderful way to help them learn their letters and letter sounds! And so, in 2008, I began putting some of these ideas into an ebook for you. Within the past two years, the little ebook grew into something much more. So much more in fact, I got completely overwhelmed with it and felt like it was too huge to ever finish. I would work on it for a while, then put it aside feeling like I would NEVER be able to get it done. It had evolved from a small ebook idea into a complete comprehensive curriculum package full of ideas, worksheets, Bible work, picture tutorials…..oh so much. My husband is the reason this project is almost finished. He saw it for what it was…saw how many hours I had put into it…saw how close it was to being completed. He encouraged me to finish, he said he would help. And now here it is, with over 35 recipes, more than 65 crafts, experiments and other projects, Bible lessons and memory verses! It’s full of pictures and instructions. It’s full of games and challenges. And most importantly, it’s loaded with ideas to inspire you and your young ones to serve others together. By God’s grace and with the help and encouragement of my family…this downloadable curriculum kit is almost complete. I am overwhelmed with gratitude. That is why I am sharing this on Gratituesday. While I’ve never mixed Gratituesday with a Giveaway before…I’m so excited that today I’m breaking my rules!! 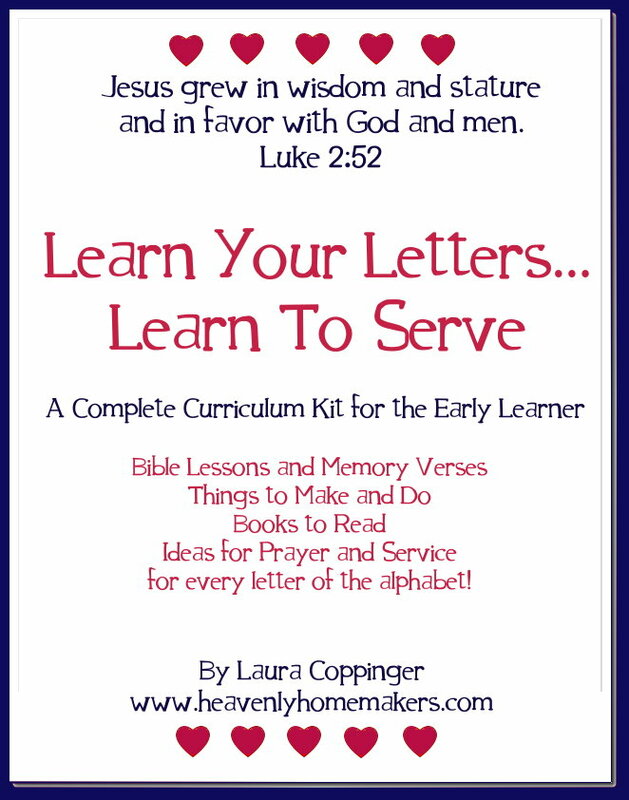 :) If you are interested in winning a Learn Your Letters, Learn To Serve Curriculum Kit, leave a comment letting me know of your interest! In addition, you are welcome to leave additional comments if you tweet, facebook or blog about this kit and the giveaway. Thank you all so much for your encouragement as I have plugged away at this project. The giveaway will end and the Curriculum Kit will be offered for sale in just a few days…just as soon as the final tweaking is completed. Can I just way…WOOHOOOOOOO!!!! Thank you Lord! Just so you know, this curriculum kit is not just for homeschoolers. Not even close! My intent was to make it usable for any and every family with young children…or for teachers, grandparents…anyone! There are SO many more details to share…but I’ll wait and share them once it is all complete and in my shop! I’ll even be offering a small sampling of the kit for free, just so you can have a taste of what it’s like. In addition to leaving comments for chances to win this giveaway, please do let me know what you’re grateful for either by commenting or by blogging and linking up with us here! THIS GIVEAWAY IS NOW CLOSED!! :) YOU CAN PURCHASE THE CURRICULUM KIT HERE! I have 4 girls and we would have so much fun learning and serving as a family. WOW! This would so be useful in this household. We are currently starting our letters and I am struggling. I want to homeschool but I’m struggling with teaching letters. This would be a God send. Congrats! That is so exciting. I’ve read your site for awhile & as someone who is just a the very beginning of working on my own site it’s very inspirational to see others success. =-) What a wonderful group of people you sound like you’re surrounded with! I would love to win a copy of this! We are mixing the ideas of 1+1+1=3 “Raising Rockstars Preschool” http://www.1plus1plus1equals1.com/RaisingRockStarsPreschool.html with the “Letter of the Week” program at http://confessionsofahomeschooler.blogspot.com/ for our almost 4 year olds preschool this year. Your program sounds like a great compliment & exactly the sort of idea I was looking for to include the “service” part in our education. It can easily include our almost 6 year old too. Awesome! This is a FANTASTIC idea! I’m so excited! We’d love to win, but even more I’m just interested in learning more about the project. Wow – you’ve worked so hard!!! This would be so fun for my kiddos (and me too!). What an amazing resource! I would really, really *love* to win this! Blessings to you for continuing on with this project until it was completed! I am so excited for you and for this wonderful book! I’ve just started working more intentionally with my 3 year old on his letters & sounds, thinking I had a great idea but then he was bored with it after 3 days. I am so thankful for the many blessings you have been to me and my family. Would love this. I am starting to work on letters with my little one, but often feel lost on the best way to teach her. What a great idea. You are so creative. Would love to use this with my daughter! I am planning on homeschooling and this would be an awesome resource for me. Thank you, Thank you! Oh, I have just been starting to do a letter a week with my 3 year old (we’ve only done one) … and I would LOVE this curriculum! I love your idea of blessing other people! I am grateful for my freedom! This is a great idea! Would love to use something like this with our family! Wow!! I’ve been looking and wanting to get a curriculum for my littler ones and havn’t found one that I like that is affordable, biblical and comprehensive enough for my liking. This sounds soo perfect! I’m so glad you’re almost finished it and would LOVE to be considered to be in the running for the free copy! As a stay at home mom to 6 kids, I find your postings encouraging and uplifting and simply a blessing, thank you! What perfect timing! I was JUST thinking today about whether I want to do the Letter of the Week program with my son or find something else. Now that he is finally showing an interest in learning and doing schoolwork like his big sister, I need to get prepared for our upcoming schoolyear. This sounds like it would be a great fit for us!!!! I love the idea of taking the letter of the week and turning it into a service opportunity!!!! What a blessing this will be! THank you so much for all that you do on this site and the wonderful things you share with us. I’m so excited about this ebook. I recently discovered your website and I’ve really enjoyed finding new recipes for things and learning from you. I would love to win this ebook. I have a 3 year old and an 11 month old, both girls. We are going to be home schooling and I’m searching for ideas and curriculum. Thanks. This sounds exactly what I have been looking for for my 5 and 3 year old! I would be very grateful to win this giveaway. I’m so thankful for my husband for working hard so that I can stay home with our kids and I’m grateful for my family as a whole. I’m very blessed! Wow, Laura. This sounds fabulous. Congratulations are working so hard and getting it (almost) done! Would love to win this for my 2.5 year old! This sounds wonderful! We are going to be doing preschool at home with our daughter this fall and this would be a huge blessing! How exciting! Good for you, Laura! What a wonderful accomplishment that will serve so many! I would LOVE to have a copy – I’ll be starting my first year of homeschooling this fall with my 5 year old and almost 2 year old boys. I’m mostly excited but partly terrified – your book would be a HUGE help! (But I’ll definitely buy one if I’m not chosen for the free one, so if someone else needs it more, by all means pass it on!) Blessings on you and yours! Wow this looks amazing! I’d LOVE to win it. Love. I am excited to start gathering ideas for my son who is still about 1 year away from preschool. I am grateful for my savior, Jesus. I am so thankful that I have the wonderful privelege to homeschool my children. I was just thinking today that I needed to get some materials together for my preschooler this year. I think that this would be perfect! If I don’t win it, I’m sure I will probably buy it. Thank you for all your hard work!! Awesome ideal! My daughter would love this. She is 4, she just loves to serve, and do things for other people. Thank you so much for the chance to win! I wish you the best in everything you do! Sounds great! I’d love a chance to use this with my two little boys. This sounds so wonderful, I have twin boys and a daughter that we plan on homeschooling and I would love to win this. Its so important to teach christian values and this sounds like it will help alot and be so much fun. Sounds interesting. In our 9th year of homeschooling, but getting ready for 4K with my youngest. Congratulations on all of your hard work!! This sounds like something our family would LOVE to have!! We have two small boys (age 4 and almost 2) and plan on growing too! I’d love to win! I already do preschool with my oldest and would love to add this to what we do! Laura, this sounds fabulous! And exactly the type of thing that I could use with my 4 boys (5 and under)! Congratulations on such an accomplishment! Congrats! That is exciting! I so enjoy reading your site and have been praying about ways to instill a heart for serving others in my children. This sounds like a wonderful idea and I look forward to reading it! While my kids, ages 10, 7 and 6 have already learned to read, we are adopting a little 7 year old boy from China in September and will start homeschooling him from scratch. It sounds like your gentle curriculum could be a good place to start. I can’t wait, I can’t wait, I can’t wait!!! I was sitting in church this Sunday thinking of ways to explain God to my 2 year old. Is that ever possible?! And for weeks now I’ve been wanting to start some type of ‘letter of the week’ project with him. Oh yay! What a fantastic idea. Looking forward to it going on sale. :) THANK YOU!!! Yay for you, Laura! I would like to offer my meager proofreading skills, if you need more help. I’ve had a lot of fun working with Katie on her ebooks. Wow – that sounds like a GREAT resource and what a blessing to serve and learn as a family. The Lord can truly work through us to help others and answer others’ prayers through our service. We would LOVE to have a copy. Congratulations Laura, I know what a labour of love this must have been and to be done, wow what a feeling of accomplishment for you!! Congratulations on nearing the end of what sounds like a super project! I’m sure it will be a blessing to so many families! This looks wonderful! I would love to try your ideas with my son (3). The service projects look fun. What a wonderful idea Laura!! We used to do a letter of the week with fun activities also, but you have taken this to a wonderful new level of serving together as a family. You have such good ideas!! I love your family’s servant heart. You know, I’ve been thinking about making up something like this, but just don’t have the time. I’m at the point in life when I have a preschooler (and toddler) and am in the middle of doing all these things. Thanks for making this great resource for others! WOW!! This sounds like an AMAZING tool! I am grateful that I have tons of laundry to do this week. It means that the kiddos had fun on our vacation! What a great idea, Laura! We have a five year old, four year old, and a 4 month old. We would definitely use this!! Thanks so much for offering a sample. That looks like an amazing resource & lots of hard work that went into it! I’d love to be able to have a resource like that at my disposal to use with my little ones! oh, please count me in! I’m grateful for bloggers like you who provide resources & encouragement for us moms & wives. Thanks for all you do! I have 2 little boys and my oldest is just getting to preschool age. I would love to be able to use this to teach him his letters and to serve. Great Idea! wow! this sounds awesome, I am looking forward to the rewards of all your hard work! sounds great! i’d love to win one! i’ve got a two-year old and 3 month old — boys! Fantastic! I’d love this resource. It sounds WONDERFUL! What a great idea. Thanks for sharing and I would love to win! I believe this would certainly not only benefit my family of five children, but our church family as well. Great job on listening to the Spirit and the nudges of your friends and family. I would love to win this for my two girls. My babies are bi-lingual and my oldest is a little behind in alphbet and speaking. I am on the look out on ways to help her more as she is 4 and will need to be catching up soon. And great job by the way on your project. I have 3 girls ages 2 & 1 and we are just starting with letters for the 2 yr old, this would be a blessing to win! I am so proud of you!!! What an amazing thing you have done:) Hard work pays off!lol Thank you for allowing us a sneak peak by this fun giveaway! Oh, I would love this for my boys! What a wonderful idea! Thank you for the chance! So cool Thanks for the opportunity to win! Awesome!! I would LOVE to win this! Thanks for all your hard work, Laura. I would love a copy of this for my preschooler. What a great idea! I would love to win this! My boys are 4, 2 and 9 months. I am so thankful for my boys and my husband! I would love to share this curriculum with my kids! Wow, nice work! Sounds great. I’d love to have it to use with my daughter. This looks like something I have been looking for. We have a 3 yr old and I am wanting to start working with him in a bigger way on his letters. More importantly though I have a burden for teaching him how to serve and witness. Thank you for all your efforts. Wow. SO excited about this! It is right up our alley. I would love the opportunity to win it, but even more so, I’m excited to see the finished project -whether I win it or buy it! Thanks for all your hard work. You are very encouraging to this just-starting-out homeschooling mom. Today, I’m grateful for your site, and a handful of others, who are generous to share their experiences and ideas and encouragement to help those of us who are not so far down the road. I am very excited to hear about your adventure and would love to win a copy. What a great idea! And I am thankful that I ‘stumbled’ across this and a few other blogs that are run by strong christian women who bless me by sharing their wisdom and teaching me so many ways that I can grow as a wife and mother. Thanks so much for all your time and energy! What a wonderful idea! Would love to win a copy! I would love to win this, it’s just what I’ve been looking for to use with my to young sons. I’d love to win. Sounds perfect for our growing family! Would LOVE this to use with my soon to be preschool age son. Thank you! Sounds like a great idea! My son would love it. I look forward to seeing it in your shop. what a fabulous idea! I love it! I have three preschoolers and would love to do this with them. Please enter me! I would love this for my three year old son. I LOVE this idea! What a Godly way to learn an earthly skill…can’t wait to use it with my 4 year old twins!!! I would be thrilled to win this for my preschooler :) What an awesome curriculum, thanks for working so hard on it! Laura, this sounds like a terrific resource. It’s something I’d love to use with my 3 little ones! Sounds great I would love to win!!! My little one is 9 months old tomorrow…I know I’ll blink my eyes and she’ll be all grown up! I would love this curriculum to enrich both her mind and her servant heart. This sounds like a wonderful idea, I would love to win a copy to use with my little girls! What a blessing to be a blessing. This would be wonderful to have. So great Laura! Would love to win!!!! That is such a great idea to help the kids learn their alphabet! Thanks for your hard work in compiling it and offering it… My daughter is at the age that she would really benefit from this and her big brother could help. Great job. I would love to win this book. Can’t wait to read it. I would be so excited to win (and my 2 preschoolers would appreciate it, too!)! Thank you for the chance! Wow! That looks amazing! I’d love to try it out! This is amazing! Congratulations on completing such a HUGE project! We’re prayerfully considering homeschooling our 2 and 4 year old daughters, this would be such a great tool to “dip our toes in” to the home school world. Today I’m grateful for my husband, for supporting me in our healthy eating journey and my daughters for helping me grow as a christian woman. I’ve learned so much and work hard on a daily basis to be a better role model for them and an example of christianity. What a wonderful idea!! I’d love to be entered. What a great book…I would love to use this with my three daughters. My oldest, three years old, is entering into the perfect age to begin. Thanks for the giveaway! Wow! Laura, what a wonderful blessing. Thanks for all your hard work. This would be great for my three little boys! What a great idea! I have been collecting ABC worksheets this summer to give my 3-year old something to do while I teach my son first grade next year. This would be wonderful! She is such a people-person, she would love doing for others, too! I would love to win it! But if I don’t, I sure hope I can afford to buy it! Sounds wonderful! Sounds amazing, would love to use this with my little ones! Thanks for the opportunity! I have been looking for something like this for a long time! I have never found something that combined learning with serving others and I think it would be a great way to teach my son life lessons along with educational lessons! I sure hope I win. wow, this sounds like a great resource!! i would love to have it for my little boy! This is a great idea! My girls (4 and 5) love this type of thing and I love doing it with them. Doing things like this helps get them excited doing their schoolwork :). Looks like an awesome idea and resource!! Oh, wow! My son is just learning the alphabet and sounds this would be great to win. Oh, Laura! I remember you mentioning that you were working on a preschool curriculum a long time ago. I’ve been keeping my eyes open in your shop for it. I’m so proud of all your hard work! And, thankful for your wisdom, humor & creative, godly, fun ideas…on your blog and in ebook form! Congratulations! This sounds like just what I need at our house. My husband and I have discussed homeschooling a lot, but we have decided to send our daughter to a private school this next year. I would still love to work on things with my 2 year at home, but had no idea what to use. This would be perfect. Thanks Laura! This is exactly what we were hoping to find for our son- thank you so much for doing this!!!!! I would love to win this!! Today I’m so, so grateful that God does not give up on me & that He gives me hope. He is so good! Wow, that’s quite and undertaking! I’m so looking forward to the finished product to use with my 4 year old and 2 year old twins! Thank you for all your hard work! I am so excited about this kit! Thanks for the time and effort you put into it! We are a homeschool family and are expecting number 5 in the winter. We have 2 school age and 2 preschool, it would be great to have something more constructive to do with the younger ones, my creativity is drained currently =)! Even if I don’t win I will be purchasing it, thanks again for all your hard work! Oh.my.word. New homeschooler, so excited I could do cartwheels. “Hope I win” would be the understatement of the year. Thanks! What a wonderful undertaking!! Our crew would love that! Congrats! Beautiful idea. I would love to win a copy. Shared the link of FB for yet another chance :D Thanks again! Sounds like a great book! I have 2 girls, 4 and 1, and would love to use this with them. Well, the chances of winning is looking pretty slim, but I would love, love, love to have this for my kiddos! I have a 4-year-old, a 2-year-old, and 1 on the way. We have a desire to “get out of ourselves” as a family, but it is so hard to do when we get caught up in the busyness of life! Thanks for putting your heart and soul into creating this! i would be interested in winning one. What a wonderful idea! My four year old would benefit greatly from this curriculum. I’m so impressed with how you’ve stuck with this project. Thanks so much! That is such a neat idea I love the idea of learning while serving. This book sounds great. I am sooooooo excited! I would LOVE to win one but even if I do not I will be buying one for sure. What a blessing you & your blog have been to me. So cool! We have one learning letters and one that will in a few years – perfect! Oh, boy. I would love to use something like this with my girls. Oh my soul, Laura! What a wonderful blessing! I have been searching for something to use next year with my little ones. This will be perfect!! I hope to win, but if I don’t, I will certainly be purchasing!! i am so.stinkin.excited about this curriculum! i think it’s an answer to a prayer i hadn’t consciously prayed yet. i’m looking for a way to more intentionally educate our almost-three-year-old this coming year and this sounds perfect! plus, since we are new the our area, having made an interstate move at the end of march, it would be a great way to get to know our new friends and neighbors better. love it! I’m just getting started building the family (an 11-month-old boy and 5 months pregnant), but in a few years, I’m going to have a few preschoolers underfoot as well. What fun — and how exactly the point of homeschooling — to combine academic learning with a biblical worldview. Great ideas!! This looks awesome! I have 7 children 14 and under and am currently looking for curriculum to specifically use for the 3,5,7 yr olds. This looks exactly like what we need. I work on finding service projects for the older kids, but run out of energy and time when it comes to the younger ones. This looks perfect! I’d love to win this ebook, Laura. It looks wonderful! What a great idea! Wow! My three year old would love this! This sounds more like a hands on approach. Thank you for fresh ideas! We did an alphabet style preschool last year too, just a verse, Bible character and then color pages of things that start with the letter. I would love to give some of your ideas a whirl this year! We are doing “preschool” again this year with both boys, and I hadn’t really completely decided what we were going to do. I definitely had to share this one on facebook, Laura. I’m so happy for you! This book sounds like a wonderful resource to have. I love that you tied in learning letters with learning to serve others. I would love to have this to work through w/ my youngest. Congrats on finishing your project. We are all proud of you and can’t wait to see it for ourselves. You always have such creative and nurturing ideas….would love to get a copy myself!!! Thanks again for your blog…I love your weekly menus. We would love this! We have four boys all little enough to use this! Thanks for the giveaway and Congratulations on finishing it! The Lord is faithful! I know this will be a blessing to so many! What a wonderful tool to help train up our little ones in the way they should go….following the example of Jesus! Oh my goodness! I am so excited about this book! Of course I would love to win it but if I don’t I am going to buy it!!! We start our first year of homeschooling this school year! I am really excited about it and also very thankful to have the opportunity to do it! Our son will be in Kindergarten but our daughter is pre-school age. So we could really use this!!! Thank you Laura for all you do and share with us! Hopefully you haven’t scratched your eyes out anymore lately! :) God Bless you!!! This sounds great–congratulations on finishing a hard project. I have three kids under the age of 4 and I’d love to get my hands on one of these copies! What an awesome idea!!! I think I’ll have to get this for myself, as well as my babysitter! I’ve got two little ones that would be into this and a 12 year old who would love to help. I am very grateful for bloggers like you who have helped me to become a more thoughtful mom and wife. I am SO excited! Yippee!!! How fun. I have a preschooler and a pre-preschooler right now. :) Can’t wait to see this resource. Thank you for your HOURS of work! May the Lord bless your efforts! I posted this to my facebook so my friends can benefit from your hard work and discover all the wonderful things you share with us on here. THANK YOU! Can’t wait to get this curriculum! Definitely an answer to my prayers! This sounds so wonderful! I would love to win!! Thank you! I posted this on Facebook. Thanks! I have three children under 4 and it’s mine and my husband’s desire that they learn to love serving other people. What a wonderful way to develop it in them at a young age. I would love to use this with my three. Please enter me as well! Sounds exciting! This sounds just amazing. I’m excited for the days ahead when Olivia is old enough! Oh I would love this! It would be perfect for my almost 4 year old and my 2 year old tagging along! I would love this to use with my three year old twins. I am so blessed to call them my children and this would be perfect to use as a teaching tool! Congratulations, Laura!! I am looking for ways to train my toddler in the way he should go, and think your book sounds like an incredible resource to that end! We are looking for a preschool routine for our little girl, I’m really excited about this! I have a 2 and 1 year old and this would be great for us! Wow! Your curriculum sounds amazing! I have searched and searched to find a great (and easy) way of teaching my guys about the Lord, how to reach out to others and their alphabet. It sounds like your curriculum is just the one I’ve been searching for! Our boys are 4,3,2 and I. It’s hard to find something that will reach out to all of them. Interesting. I had no idea you were working on something like this. I have been creating something similar…we should talk. Sounds like yours would make a great Sunday school curriculum, too. I would love to have a copy! This curriculum sounds wonderful!! Would love to use this with my 3 and 5 y.o. and include the older ones in the sharing! Love this! Can’t wait to check it out!!! I would love to use your ideas with my preschoolers! Thanks for all your hard work! This sounds amazing Laura!! With all my littles I would love to win this. Thanks for all the hard work you’ve put into it, can’t wait to see the finished product! that sounds amazing laura!!! what a wonderful idea and i admire you for putting it together. i currently have 2 preschoolers and would love something like this to use in the upcoming school year. This is really exciting! I would love a copy for my boys, 4 and 3 years old. I am always worrying about how I am going to teach my daughter as she gets older, and this book is such a great idea! I need ideas, because I am not very creative. What a cool concept! no continuity. This is all in one book! Thanks Laura! I have a friend who does letter days but you have taken it to a whole new level. This whole program sounds amazing! Oh Laura this would be so exciting!!!! I have a kindergartener/1st grader (not really quite sure where he falls) and a preschooler. I’ve been wondering what to do with my preschooler while I’m doing other things with the older one and this would be perfect!! You have such a wonderful gift for creativity! That’s awesome! I’d love a copy! I would love to see this curriculm whether I win it or not. It sounds very well put together. I hope we get to see a sample of it!!! I am thankful for this lovely day that the LORD has made, quiet , rainy, cozy. Have a sick 2 year old in bed sleeping after a sleepless night. So am thankful she is resting now. Pray for her wellness. thank you! Wow, love this concept for the early learners. Wish I had this for my first two. Would love to win one for my last early learner. Thanks. I love this idea! I want to win it but I will be buying it if I don’t win! This sounds so wonderful! I have been trying to decide what we are going to do this year with my 4 and almost 3 year old while the 15month old tots around. Thank you for taking the time to put this together! I can’t wait to see the sample!!! What a fantastic idea! I love the idea of helping the children learn to serve while they are learning. I would love to win this. It will definitely be a blessing to whoever wins. Thank you for all the time that you put into it. May God bless you greatly for all your hard work. I am always looking for things like this to do with my 2.5 year old little guy! Can’t wait to see it! How wonderful to be almost done! I’m grateful to read blogs that have such wonderful content and writers that inspire me to be a better parent. I’m also more than a little grateful that the yucky stomach bug that hit last night around 8:30pm seemed to be a one-time thing (especially since she was in the car seat at the time). I am a Homeschool Mama to 4. My youngest two boys are 8 months and ahe 2, but I plan to start some preschool learning for my 2 year old this fall. I would love to win this! :-) It sounds awesome. I am sure it was worth all those long hours! I have three-year-old twin girls and another on the way. I would love to have a curriculum that I could implement easily with my girls while pregnant and then caring for a newborn, and then use again with the baby when he or she is older. This sounds perfect. Thank you. What an awesome learning tool! My son just turned 4 and I feel like I am so far behind in teaching him, as I am a full-time student as well and Mom to three (one due October 5th). As a result time is scarce and has to be efficiently allocated. It would be wonderful to use a program that has already been well thought out. I am always looking for learning tools which encompass the values that I treasure. I am so grateful for my children. I love this idea! What a lasting blessing for our children! I have 3 little ones, the oldest being 5, so this would be perfect. As far as gratitude, I’m extremely greatful for my children and my husband. They bring so much joy to my life! My kids are 4, 2, and 1 so this is perfect for me! Very exciting!! Great! Would love to have a copy! This sounds like a fabulous resource for a Christian home and also possibly for a Sunday School teacher of young ones…. will definitely be purchasing one as soon as they are available! Thanks! Sounds like you’ve put a lot of work into this. I would love to have it for my little daughter. I can’t wait to use this cirriculum! What a helpful tool for moms, teachers, nanny’s, etc. Thank you for your hard work…I’ve been so blessed by your website and can’t wait to see how your cirriculum will bless our family and children I care for. Wow. This sounds amazing! I’d lov eto win a copy! Sounds incredible Laura, definitely something I would love to go through with my 3 year old daughter. That sounds wonderful. I’d love to do it with my almost-three-year-old. sounds like this would be a great resource/tool for my son-in-law, who needs all the help he can get!, to use with his two preschoolers. and, while my daughter’s two children are already being homeschooled, i’m sure you’ll have many ideas she can incorporate in her curriculum for the older children. This looks great!! I would love to have this for my 3 1/2 year old. Thanks for a great giveaway! Congrats. I think this is a wonderful idea. I would love to win a copy. We are just starting to homeschool our 3yr old son. We would like to have something to help us. Thanks so much. Love your website. Way to go! What a blessing to others! This would be great to do with my recently turned 3 year old. I also mentioned this giveaway and your neat system on my facebook page. I have two children this age and would love this ebook! Hurray for you! This sounds like a wonderful tool! Would love to use something like this! I’m never one to pass up a give-away, and this one looks great! I would LOVE to share it with a couple of friends trying to figure out what to do with their little ones for next school year! Hi Laura, I am not hoping to win this for me as my kids are 18 and 16 now, but I have a dear friend that has a 3yr old and a 18 mo. old and I think she would benefit from this she has shown interest in homeschooling her kids and I am trying to help her in that direction. I know that you will have alot of entries, but I do hope that I am the one for her sake. Oh, Laura, this looks wonderful!! I would love to win it! I am in tears as I read this because I have been thinking about how to include service in our family as well as schooling, but I am such and introvert, it doesn’t come easy to me. I love this idea and am so thankful for creative people like you to help my family and me along this journey!!! thank you!! I hope, I win, but if I don’t you better believe I will be one of the first orders. What an awesome and purposeful idea! I’m in the process of transitioning into a leadership/coordinator role with our new MOPS ministry in our church. This year we are praying for the Lord to lead mom’s who don’t yet know his power and grace to our group. Alongside this ministry for mom’s of preschoolers is a MOPPETS program for their children. I’m sure your book could provide us lots of ways to teach those little ones as well as offer encouragement to mom’s as they begin to desire to have the Lord touch their children’s lives as well. I look forward to getting your book and using it with my own little ones and also possibly blessing other families with it as well. Thanks for letting the Lord lead you to this project and know it will have an impact for him on his most precious children. I LOVE this idea! This sounds like a wonderful way to learn your letters and reinforce them with loving kindness to others, fellowshipping and witnessing! You can’t get any better than this! This sounds like a wonderful e-book. I have 2 young ones who could really use this, and a couple of older ones who would benefit from the practice of serving. Just this last weekend we had friends visiting and we talked about how to teach our children to serve each other as well as others outside the home! Hope I win! Thanks so much! WOW! You are amazing. Thanks for sharing with us!!! I want this kit! It sounds so great and I am going to tell lots of people about this. What a great idea! I would love to have a set. I have a 4 year old and 3 year old, plus I’m the children’s church director. I think it would be wonderful for them! I would love to win! Congratulations on finishing! Congrats on nearly finishing the curriculum! I would love to win copy for our growing family. Oh wow! I would really like to have a copy of this. Looks like it would be a great ministry tool as well. This would be SO great to have! Thanks for spending countless hours on this so others can be a blessing to their families and others. Thanks you! I am so thankful for family. When things in life get hard, it is wonderful to know that there are people who know you best in your good and bad days, and yet still love you. I shared the giveaway on my blog–www.graciousdaughteroftheKing.blogspot.com! Wow! Congrats on getting this project tackled–it sounds terrific!! Wow!! This sounds wonderful!! I would love to use this with my family. I will be homeschooling for the first time this year!! Much prayer needed!!! oh this looks like a wonderful idea to use with my 3yo and 4yo! I havemade curriculum type things for my older kids and I KNOW how long that takes. kudos for all your hard work! Wow what a great idea!! I would love ebook! Oh Laura this is exactly what I have been looking for. I want to start this fall with my 3 year old but didn’t know where to begin. I have looked at other programs but thought they where not right. I am so excited. Thank you for sharing the wisdom that God gave you. Bless you. I am soooo excited! I hope I win this one. I have three littles and while my biggest little decided she wanted the opportunity to go to school (we are testing the waters) this year. I have an awesome 3 year old dude who would love to have some fun! Thanks for the chance and CONGRATS on the hard and Great job you have done! I would to use something like this with my little girls! I am definitely interested in winning a copy of your latest project! My children are elementary age, but I have been searching for ‘service’ opportunities for them. Besides, they are still young enough that they enjoy some of the things you mentioned. Today I am grateful for organic raspberries that my husband brought home – I am making jam! Your joy is a beautiful thing. Congratulations! This is great, it sounds like a great book. It would be great for my little one. I am so excited for you, Laura. I can’t wait to get it for my grandchildren. You are truly a blessing. How fun! I’d love to win your new e-book. Way to go on your accomplishment. Well you just about made me cry (preggo, so not that hard) with this post! I have been thinking about trying to put something together for my little ones along these lines. Now I don’t have to! I never win things so I’m glad you’ll be offering if for sale as well. I’m sure it will be worth the investment. My 3 year old is really getting interested in her letters and I’d thought about starting to focus on a letter each week and link it with people we know. I love the idea of adding service to it. Looking forward to the kit!! I LOVE the idea of incorporating a giving spirit with our preschool curriculum! Your book would be a blessed addition to our preschool this year!! Congratulations on “almost” finishing it!!!! What a wonderful tool! I would love to use this with my own family and at my church. I am extremely excited about this e-book! I have a 5yo, 3yo, and 2yo twins, and we are going to start our first year of homeschooling this fall. First and foremost I want to teach my children about Jesus, how He put others before himself, and how He expects us to do the same. This sounds like just the tool I’be been looking for! Thanks for your hard work, and thanks to your husband for encouraging you to finish this, so it can be a blessing to others! I would love love love to win this to use for my 3 year old and 1 year old! I’m so very thankful for my family – close and extended. I’ve been blessed with a fun and loving family. This looks like a wonderful book. Wow! What a great idea (or ideas). I would love to use this with my children. May God bless you for all your labor of love for the rest of us moms! Wow, that sounds awesome!!! Going to link! Laura, I am so happy for you! Many, many congratulations! What an accomplishment to have achieved wuch a large project! Bravo! This gratituesday I am thankful for you and for the inspiration you are as a chef, a mother, and a Christian. Thanks for your blog, for your inspiration and wisdom! Wow, Laura! You are amazing. I was just telling my mom about you last night and how God has blessed you with so many talents. Thank you for being real and giving. I would love to win this book! This sounds wonderful. I was planning on starting preschool with my 3 1/2 year old this fall, this would be great to have. By the way, I truly enjoy and have been blessed by your site so many times. Thanks for doing all that you do! VERY interested in your new book. Laura. I’m looking into different early learning curricula to get a head start on making what can be an overwhelming decision (my son is 2 and we are expecting another in October!). Thanks for all your time and effort! Laura, thank you for your time and devotion given to this project. It sounds exactly like what I’ve been looking for. My little boy would love it! This looks like a wonderful tool and I’d love to have a copy!! Wow I would love this. I have 6 under 9 and I am always looking for new and creative ideas.We could really use this in our curriculum this year. Thanks so much. I would also love to win your book! Sounds like you did a great job with it! What a blessing! I have two children 5 & 2 and this would be so great. God is great with prefect timing. I was just reflecting this week how great our mission friends (pre K) leader at church is with having the young ones do mission projects that bless so many. Excited for you and all the lives this will touch for the glory of God! Oh what an amazing accomplishment. You are an inspiration. I barely get out of the kitchen each day and look what you’re done–created this whole curriculum! I CAN’T wait to see it and use it!!! I would LOVE to use this with my little ones. My almost 2 year old is so interested in letters and it makes me so happy :) Our newest baby (2 weeks old) isn’t there yet, but how fun would this be in the future? What a great idea! I am grateful for the feeling of starting to be back on my feet today! It has been a longer than expected recovery due to some surgery and I am grateful to feel stronger and more with it every day. I so love being home with my babies. Wow! What a blessing you are to others. It’s been on my heart to be teaching my kids to give in a more tangible way. But I’ve been overwhelemed at how to do it. This curriculum seems like just what I was looking for! This looks so amazing! My daughter just turned 2 and I’m hoping to start working on some things with her soon. This would be perfect. congratualtions and thank you! Congrats on your accomplishment!! I would love to win a copy! This is going to be a huge accomplishment to you and blessing to so many. I am thankful there is good wholesome content to add to our curriculum. I’m so enjoying your blog & recipes! I would love to win your new project – a way of learning that links friendship and serving others would be a great thing for my 3 boys (8 mos, 3, and 5…homeschool begins this fall). Thank you for the time you put into your blog! Congrats Laura on finishing this. Sounds like a great book! What a blessing to all of us with preschoolers! I have two 3year olds and a 1 year old, and I’ve been looking for something like this! Thank you!! I am a total SUCKER for these things! I have three 5 and under and one on the way! I am ALWAYS looking for these type things. :) Thanks for all your work!! This sounds wonderful. I have a kindergartner and a 3rd grader. They both will benefit from being service minded. I would love to be able to use this. What a fantastic resource! I am SO grateful for like-minded mommies who desire to help their children grow not only intellectually, but spiritually. Even more grateful for the tools to help us do so! Thanks Laura! I love your blog and have incorporated many recipes into my menu planning! I would love a copy of your new book. It looks like such an amazing resource! I have a 4 year old, a 3 year old and a 20 month old and would love to use it for all three of them. I would love this ebook to help me with my 3 year old! We are starting our homeschool adventure this fall and are also moving to a new state in the next 2 months. This is an absolutely wonderful idea and I can only imagine the amount of time and energy that went into this! Praise God for the wonderful blessing this is to our children and other families and the glory it brings to our Father! I am grateful that God considers me worthy to take on this task of teaching my children! I wholeheartedly will be leaning on Him, as I have no clue what I’m doing!!! Thank you so much Laura! Congratulations on such a wonderful accomplishment!! i know this will benefit many families. i will be spreading the word for you and would love to have a copy of my own!! This would be great for me because I often have a lack of direction. I am thankful for my kind husband who served me and our kids while I was sick. Congrats. And it’s 240 pages?!? What an accomplishment! It sounds amazing. My littles are 2 and 3 so I imagine that we could easily put this to good use. Today I am thankful for the opportunity and ministry of being a stay at home mom and for the amazing husband who makes it possible! That would be perfect for my 3-year-old! Be sure to let us know the moment it is available for purchase! Would love to have this for my boys. I would love to win this – it sounds perfect! Great idea! I would love to win one of these. I currently have one and three year old boys. I am currently looking for something to start working with my two little ones. This curriculum looks amazing. I would love to incorporate the bible into all our lessons. I would love to have this curriculum. I would love to win this! I have a 3 year old who I try to do educational activities with but often I’m at a loss for what to do so this would be perfect :-) Thanks for working so hard to put it together! This is exactly the sort of thing I’ve been looking for! I have a 3 year-old and a 1 year-old who would very much enjoy this. I’d be so grateful to win this! I love blogging. I love reading blogs. I love the people I meet when I blog and read blogs… and yesterday, I loved having the opportunity to meet one of my cyberfriends in person. It was like we had known each other forever! How neat! I have a preschooler and a baby and your kit seems like just the right thing for us at this moment. My preschooler is eager to learn and we are looking for something to help her. Thanks for the opportunity. As a busy mama of 5, I would LOVE LOVE LOVE to have this fabulous tool to use with my kiddoes…ages 4, 3, 2, 1 & newborn! We are definitely ready to get going with the “homeschooling” thing and this will be a wonderful tool for that purpose. My kids are starting to get the “gimmes” too, and it sounds like this project of yours is going to help this tired and creativity-deprived mommy teach my kiddoes some great lessons on gratitude. I would be forever indebted to you if I were chosen to win this. This sounds awesome and I would love to win this. Thanks for the awesome giveaway! This sounds wonderful! I would love to do it with my girls. With my oldest we just did our best to do the letters and I made it up as I went along. Now with two girls it would be nice to follow something that teaches letters and Jesus! oh my gosh! Serving has always been such a goal for us to share with our kids and often we don’t do a very good job. Our kids are 8, 6, 3, 2, and newborn…SUCH great years to share this with them all!!! Thanks for all your hard work! I would love to win this. I have a 2 year old daughter, and I have been wanting to start working on letters with her. I am starting preschool with my 3 year old this year and this would be perfect. I so hope I win! It would be truly a blessing. I too would love to win your preschool curriculum kit! Thank you for such a wonderful and inspiring blog. My nearly 4 yr old does great with her letters but I’m always looking for new fun projects to do with her. I also have a 17 mo. old and a bun in the oven who will need to learn their letters some day :-) I’d love to win your ebook!!! I use Sonlight with my 7 yr old daughter, but would love to use this with my 2 1/2 yr old son. It looks fabulous! I grew up in a family that was not very spiritual, but I thankfully found someone who guided me in the right direction. Now I am part of a family whose lives are centered around the Lord. I don’t have anything in my childhood to go by to raise a child who knows and loves his savior which is why I began reading this blog. It would be fantastic to be able to have so much advice and activities to go by!! And I am thankful for leading the blessed life I live. I would love to win this! I have a three year old and a one year old and in addition to acedemics, we are always trying to teach our children the blessing of doing for/giving to others. Great job on your curriculum! I’m so excited to see more! This sounds like such an incredible piece of work. I am the coordinator for our local MOPS (Mothers of Preschoolers) group and have two preschoolers of my own. I would love to share this with my two boys as well as show it to my friends in MOPS. Blessings on your writing. I am so thankful for the friends I’ve made in MOPS who recently took my kids to the park and brought us a meal while I was sick. LAURA!!!! I’m SO excited! I’m am definitely buying this when you’re done. My kids are going to have a blast with it. I would love to do this with my preschooler! Thanks for all your work. This sounds wonderful! I know all your hard work on this will pay off with so many of us mommas needing something just like this for our little ones. This is a wonderful thing. I would be so excited to win this! I have one little one now, and with that comes the looking for a good program for her to use. I am realy looking for something that not only teaches about the standards, but also teaches about our Heavenly Father. It soounds like a great amount of time and effort has gone into this project. My kids are beyond this but I would be interested for our church family – especially our summer programs. Sounds awesome! What a tremendous amount of work you’ve invested–along with great thought, care and love. May the Lord bless you greatly through this neat project! What a great idea! I’d love to try it! As a mom of two preschoolers, I would love this! Laura, what a wonderful thing you are doing! It would be awesome to win this. The Lord has truly blessed you with a wonderful gift. All your boys (husband included) are so lucky to have you!! Congratulations on all your hard work! I would love this tool for my 2 preschooler at home! Great idea! I just shared about this on Facebook. Looking forward to it! And I just tweeted it as well. I love love LOVE this book! What an abundance of motivation and skill the Lord has given to you…and now you are choosing to bless others with it! Thank you! This sounds so neat. Our oldest is just heading into preschooler age. We would love this! Yay! This looks great….and I’ve been looking for some ideas as I start to homeschool my preschooler this fall. Perfect! Great job on finishing your project…the rest of us are blessed by it!! SOUNDS GREAT! I’M SO BLESSED WITH MY FAITH AND FAMILY. I WOULD LOVE ANOTHER GREAT TOOL TO TEACH. I am so grateful that I am 38 weeks along in my pregnancy. My first child was born prematurely, and although he is healthy now, we struggled alot in those early months. I am so thankful to have made it this far. I would love to win a copy of this book because we hope to have lots of kids. We would be very interested in Learn Your Letters, Learn to Serve. My family and I are just starting this wonderful homeschool journey with my daughter 5 and son 3. We are actually very greatful that God has blessed us with the freedom and the ability to homeschool. Oh, please enter me in the drawing! It sounds like an incredible book!!!! Wow this is totally awesome that you are doing this. It would be perfect with my 4 and 2 year old. Definitely will be used along with our other homeschool fun things! I absolutely love your blog and would love this, I have 2 girls and another baby on the way, it would just be awesome. Thank you for the chance! We’ve been trying to focus on serving with our kids, and ways to bless others together. This sounds like a great tool. Thank you for taking the time to put it together! I’m so thankful for the work God has been doing in my family. Our heart for the poor and needy has been increasing, and I’m excited to see where He will take us! I enjoy reading your blog, and my family loves your recipes. We would love to use your book. I am a mom of 5 (soon to be six). Thanks again. I would love to have the chance to win. Thank you. This would be a perfect “win” for us as I’ve been thinking of starting a program with our 4 and 5 year old children! WOW! It is such a joy to see you finish this project. I can’t wait to get my hands on this. I have been looking for a great preschool curriculum for to start this fall that would be fun and help with learning. This will be great for our family. Today I am so thankful for the great weekend we had with our family celebrating the 4th of July! Sounds wonderful and would be a fabulous asset to our home. I love the idea of the alphabet project. Congrats on (almost) finishing! Sounds like a GREAT tool many of us could benefit from! I am so excited that you were able to finish your project. I am looking for an early learning curriculum for a friend and am excited to see what you have put together. Kudos to you! Would love to win this. I have been looking for something to use for the alphabet with my little one. What a great idea!! This would be awesome for my little ones!! I would love this! I start school next year with my 5 year old and I need activities for him and my 3 year old. I would love this! It sounds great for my 3 and 5 year old. sorry, didn’t mean to post twice! Shared this on my Facebook page also. Would love to get this for my kiddos! Can’t wait until you finish it! Congratulations!!! I remember when Justus was doing this. He brought me (Jerica)a Jar full of Jellybeans with a note that he (Justus)and Jesus loved me! I think I was 15, and did it ever make my day:)I’m so glad to hear that other little ones will be encouraging others the same way. This looks fabulous! I can’t wait for it to be finished. Congratulations on your accomplishment! I would love it! I homeschooled my daughters and now they are homeschooling their children. I am gathering material to help them. Would love to pass your book on to them. I would love to win this!!! So glad it’s finally finished!!! What a fantastic idea! I would love to use this idea with my preschooler this upcoming school year! Sounds like a wonderful idea and something I know I need to incorporate into my children’s lives more. Sounds exciting and helpful! I’ve been feeling lately that I needed to add more “fun” to our learning and this sounds like a helpful way to do that! GOOD JOB on finishing it!! What a great effort. I can understand your Gratitude in getting to this point. Well done in persisting and getting it done. I absolutely LOVE the idea of combining learning with serving and blessing others especially in these young years when it seems quite hard to fit everything in. Why not combine it all. Wonderful idea and even more congratulations for taking an idea and turning it into a reality – that’s the hard part!! Wow. I can hardly wait to get my “hands” on that. Sounds like a dream!!! This looks intriguing. Please enter me. Today I am grateful for a great library and fun summer reading programs which inspire learning. YAY for you! That is so exciting! I would love to win this for my kids! This sounds wonderful and I would love to go through this with my 3 year old and 14 month old! Thanks for the encouragement! How fantastic that you’ve finishes such an awesome work. we would be delighted to use it in our homeschooling endeavors, so double thanks for the giveaway. Wow, Laura- this is SO neat! You have certainly put a lot of work and effort into this curriculum and I am glad to have a chance to win this giveaway. Thanks for the opportunity! What a great way to incorporate serving others into your teaching. We’d love to use something like this around here! congratulations on being so close to the finish! We’d like to try it out! This sounds like a great book! I would love to try it out with my little ones. How wonderful! I just found your blog and have been reading and reading. I would love the book for my kiddos as we begin our homeschool journey! Congrats! What an exciting project! Thanks for putting it together and giving us an opportunity to benefit from this. I’m thankful for people like you who make my life easier! Congratulations Laura! Thank you for working so hard on this project for all of us. I would love to be entered in your drawing to win a copy. I was planning on starting a Letter of the Week type of thing with my 4th little one this year and we’ve already decided that serving others would be our biggest theme, so this would be absolutely perfect! YAY for you! I have so many projects that I would like…love to finish. You are an encouragement in so many ways. And I would love to win one. This is wonderful. Congratulations. What a big project. It sounds wonderful. It is something that I would use with my little ones now. Thank you for putting the time into this project and letting God use you in this way. I am getting ready to start homeschooling in the fall and my oldest (of four boys) will be in Kindergarten. I have been looking for something to use with my 3-year-old that would also be appropriate to use with my 5-year-old. This sounds perfect. I would LOVE to win a copy! I love this idea, was just looking for ideas for next year to focus on letters with my 3 year old. This sounds like a great resource to use with my pre-schoolers next year. Thanks for the opportunity! What a wonderful idea! I’m glad your husband recognized the value of all your hard work and encouraged you to complete the project. I would love to have a copy of it. It sounds just perfect for my daughter! Today I’m so grateful for the way God reveals a bit of Himself to us in the natural world He has created: the provision of the rain, the warmth of the sunshine or the joyful abandonment of kittens at play. I would love to win this! I have an almost 3 year old. We have been doing a letter a week and we are on S, but I know we will have to go back through the letters at least once. I love the emphasis on serving others! What a treat if I won something like this. I think my little guy would really like it! While half my children know their letters, the other half do not. Thanks for this chance!!! Would love to win this for my grandsons. Good for you (and your husband!) for completing it! I’m grateful that my daddy had successful heart surgery today that should improve his quality of life until the Lord “graduates” him to heaven! This looks like a great tool for preschoolers! Thanks for putting it together and for the giveaway. Sounds like fun for my 2 year old and eventually her baby sister! Wow! This looks great! I’m so excited for you in getting it all finished up! It feels so good to get big projects accomplished. I’d love the opporunity to win this. Wow Laura, what an amazing blessing!! God has definitely gifted you!! I would love this curriculum as I have a 8, 6 & 4 year old I will continue homeschooling in the fall. I almost considered sending my 4 yr old to our church’s Pre-K just so she could get that extra “edge”. Hope I win!! What a great idea! Laura, I have recently discovered your site and I love it. I am the mom of 4 boys as well. You inspire me! Would love to win this…. I would love to win this! I love all the ebooks I have gotten from you, and I know your curriculum will be great! I have three little ones that would be so excited to do this! You are a true blessing. Thanks for the opportunity. Congrats on finishing such a rewarding project. I’m sure this is going to be a great help to many families. I’ve searched a lot for some early learning ideas for my little girl. This looks great! You are so creative, Laura! What a wonderful way to learn and minister to others…I would love to be entered to win! Your new curriculum sounds so exciting! I really hope to win a copy, but if not I will definitely purchase one to use with my soon-to-be 4-year old as we begin preschool homeschooling this fall. I already have your ebook of Fun Things To Do With Preschoolers and have been using it all the time, looking forward to this next curriculum set! This is exactly the sort of thing I’ve been hoping for. I’ve tried to organize a simple curriculum based on letters for my 2 1/2 year old, but can’t find the time to think it through very well. He is ready for more than I’ve been giving him – he understands so much already it amazes me! I just had my first precious baby and am already excited for homeschooling. What a wonderful resource this would be! What a wonderful husband you have! Your ebook sounds wonderful, and since we’re just enter into the preschool years, this would be perfect for our little guy. Thanks for offering this wonderful tool! Congrats on finishing such a big project! I would love to win one to use with my 2 year old in a bit! Wow, this looks wonderfu. I have been wanting some ways to serve alongside my children, but had not been successful in ways to incorporate my youngest. Thank you for your work on this! I am grateful for people who share their God given talents, like you! Sound like it is full of great ideas! Would love to win one :) thanks! I would appreciate this as a ministry to my children and me. I am so grateful for children who ask for and have a desire to learn God’s word and grow in Him. Now this excites me! I have been on the look out for a curriculum to teach my children about Godly character and what better way to do it…serve others! I would love to win this and if not, I’ll be downloading it! :) Thank you for all of your time and hardwork!!! You are a blessing! This would be a great tool for our family. God has truly blessed you with a mind for ideas and organizing your thoughts in a way that blesses others! I would love to use this tool with my kids. I have an 8yo boy, a 4yo boy, 6mo baby girl and I also babysit a 23 mo old girl and 3 mo old little boy. This would be an awesome addition to our household!! Thanks so much for offering to give one away!! Laura, how exciting!!! If I win this it’ll be put to very good use with my twins! Good luck on this final last leg of editing! What a great idea! Love that you incorporated serving. We would definitely get use out of this if we win. What a blessing this would be! Thank you for the encouragement you have given me. I love your blog. I love all your E-books, and look foward to using this one with my younger 2 (I have 4 kids in all). Thanks for all your effort to share such wonderful information. This sounds like something I could use at home with my son and also at church teaching the little ones during Sabbath School. I’d love to win! So excited for you to have this almost finished! I’ve been looking at homeschooling my two 4 year olds next year and perhaps this will be just what we need. Can’t wait to see it! THanks for all of your healthful living knowledge and for sharing it with all of us. Blessings! We’d love to try this out! I have three girls – 6 months, 3, and 5. :) Thanks for the chance. We are just beginning our homeschooling journey and would love to have this book to start. I would LOVE to have this! I am a pastor’s wife and mom of twin 5 year olds and a 3 year old. We love trying to find creative ways to serve our church family. I love the idea of combining service with learning phonics. What a great idea! Congratulations on finishing your book! It sounds like a wonderful concept. I’d love to win this, what a great tool! my guys are both 4 and this would be a great way for us to supplement what they learn in preschool! This sounds great! I would love to use it with my littles. I am thankful that God’s grace is sufficient to cover my weaknesses! I am so proud of you and all you’ve accomplished! Our church has been looking for a new preschool program. Your curriculum would be wonderful to win, and a perfect fit! Thanks for the opportunity! laura~ wow what an undertaking. congrats on being almost done. i can’t wait to see it. i’d love to win a copy and be truly honored. dh and i are looking for more ways to teacho our dear little ones the majority of whom are preschool aged to be more giving and focus on others. This looks wonderful! Thanks so much for the opportunity to win it; it looks like it took tons of hard work! What an awesome idea! I’m just starting to homeschool my oldest and we have 4 kids 5 and under so I’ll have a few more to follow right in his footsteps! This is a wonderful way to teach how to serve others, a quality we definitely want our children to have. We live in an rv full-time to travel with my husbands job, so any ideas to make schooling easier for me is so appreciated! Thank you! What a great tool for Mom’s everywhere. I would love some new ideas to try out on my daughter who is night and day different from her older brother. Who ever receives a copy will be truly blessed by it! Thanks for dedicating your time and listening to the Lord! a friend of mine just turned me on to your site, and I am so glad for the encouragement… we live in NYC and when I tell people that my 3 yo DD is not in preschool and we will homeschool her, people don’t even know what to do! it is all new to me and any help and encouragement are greatly appreciated! Would love to have this for my three littles. You do great work, Laura! Shared about this on FB! What an awesome idea!! Thanks for your encouragement to us mom’s of preschoolers. oooh! This is so cool! What a neat way to turn learning into serving! I’d enjoy winning this, but if I don’t, I still might buy it! Wow, lots of hard work. Amazing book! Wow! How exciting! Can’t wait to see it! I don’t think I’ve ever seen anything like this. What a neat idea! We would love to win the giveaway!! Wow! What an incredible idea! I’d love to win! Wow! You are amazing. Your web site is a blessing for me. I’d love to win the give away. Wow!!! What a neat project of love…can’t wait to check it out :) Would be great for my kids! I am so excited about yor new curriculum too!! I’ve been moved to think about how we can teach our little children to serve from a young age, throughout the year, not just on ‘special occasions’ and so this may be an answer to our prayers! We’d love to be entered for your giveaway! I wana win!!!! I’m just starting “school” with my 3 year old! This looks amazing. Just what I am looking for. So glad I stumbled upon this. what a great idea- sounds like a helpful resource! Thanks for the opportunity to win this great resource. Many blessing for all your hardwork. This sounds like a great resource to have. Wow!! This is perfect timing! My youngest is 4 and I have been searching for a program we can start at home. I love this idea! I love that you have finished this at the perfect time for my family! I would love to win a copy! I am so excited! Thank you for all your hard work. this is exactly what I need, I would love to win! What an awesome resource. I really look forward to the completion of this book. In some way I feel like I have missed the boat on teaching my little ones to desire to serve others. We were really good at service before we moved, my daughter was always finding ways to serve others. We moved two years ago and life has been one huge hussel. My boys have missed the serving concept. We have been so focused on our needs with a new home and new baby. I look forward to this book. I am grateful there are people like you willing to create things for the glory of God to share with others. Laura, please hurry, hurry, hurry. Your book sounds absolutely amazing and I’ve been looking for something just like this. I want my children to have a servant’s heart and honor their Heavenly Father. Throw a little learning in the mix and how can you go wrong? Even without winning this book, I’ll definitely be purchasing a copy. Would it be going overboard to say “I love you”, okay maybe it is overboard. As a homeschooling momma this would be amazing! I think this looks great! I love the font used-what a great idea for a book. I have recently fond your blog and this looks wonderful!! I would love to do this with my daughter and my son when he is old enough! I have a three year old and two year old twins. This would be so fun! Your project will be a blessing to so many people, what a beautiful thing to have done with your kids and to share with others! My little one is only 2, but I can’t wait to read your ebook. What an awesome way to learn through service. Thank you for all you do, I love exploring your recipes and blog entries! How do you find the time?! You’re amazing!! :D God has really equipped you with the gift to do this – what a blessing to others you are and will be. My oldest son (one of THREE BOYS – #3 due in a month) will be 5 soon and I am looking for something like this to work with him on over the next year. It sounds perfect! Definitely interested. Thanks so much for your blog -I look forward to every post! This looks AMAZING! Just what I am looking for, thank you for such a generous giveaway. That is such an awesome idea…I love your blog so much, it is one that I return to again and again for encouragement. I would love to win a copy of this. I am so blessed by your blog. I would love to win this. My husband and I were just talking about trying to find a curriculum for our 18 mo. old. I just shared this on Facebook too! I know my friends will love your blog. God Bless you for taking the time to share your life with us. This looks fantastic, thanks for sharing it with others! What a great resource….I would love to win this for my homeschooling preschooler! Thank you for your generosity! I would LOVE to win one! What a great idea! I am grateful to have flour for your cinnamon roll recipe and bread recipe soaking on my counter top right now. I wish you were my neighbor, you are amazing! I am so thankful that I have stumbled upon your website! I just happened to be needing a recipe to can tomato sauce and somehow made my way here to your site. I was so enlightened by your attention to detail that I started browsing your website. I must say that I am VERY impressed. You have inspired me to start taking time to cook home cooked meals for my family. I could not have found your site at any better time since I have a five month old that will be eating “real” food soon and it is important that I have healthy food to feed him. This new kit would be perfect for our family to help our son grow not only in the flesh but in the spirt as well. May God bless your family because you have blessed mine! God has really changed my heart to homeschooling these last few years. I want my children to have a servant’s heart. I would love to win this curriculum! This looks like just what I need! I’m really anxious to see the sample now! Thank you! I would love to have this tool for my preschooler. I’ve been looking for something to use with him. Thank you for your effort you have given this project. This looks wonderful! I would love to win (or buy) one to give me guidance with my 3-year old. It looks like a great resource :) Thank you for sharing! My baby girl is so anxious do to “school” like her brothers. This would be great fun for all of us to do together. Can never have enough opportunities to learn to serve. Love your site – the kids love the sloppy cornbread! We’re really trying to change our eating habits – thanks for the inspiration. This sounds fascinating! I would love to utilize it with my 2 kids. Thank you! Wow! I’d love to have this to do with my 2yo. He’s just starting to get interested in learning things, and serving others is something I think is falling through the cracks for so many people. Thank you for all your hard work! I’d love to win this book. So unique! I shared about this giveaway on my facebook account. I havethree kids, ages 4, 2, and 1. I would LOVE this! I am really excited about this! I probably won’t win, but I’m going to find a way to squeeze it out of our budget to buy this (hoping it’s not out of my price range.) I have a three year old and one on the way, and I’ve tried a “preschool” thing before, but it just kind of slipped through the cracks. I’m really excited to read this! We have 2 litte ones, ages 4 and 2, and another on the way… this curriculum would definitely come to good use in our house! I’d LOVE to have a copy! Congrats on such a great project, by the way. You are an awesome mama!! Love it! I am thankful for the opportunity to stay home with my children and to educate them. Thanks, Laura! I would love to win this. Your books are always so inspirational! I made a post on facebook. this looks so neat! Would love for my little guy! Would love to get this…I homeschool my kiddos! This would be wonderful for my daughter. I would love to win! I would love to use this with my little ones!! Looks fantastic! I love to read what you have to offer on this site. So much wise advice. I am a grandma and would to love to get the opportunity to win this book to share with my 9,5,2 year olds. I am so very gratiful for the health of my dear grandchildren and that their mom and dad take them to church and teach them about Jesus. Thanks for your articles. Look forward to reading more. I would love this for my almost 2 yr old! I would love to have this for my 2 little ones. What a beautiful idea!!! We would LOVE to have one in our homeschool and can’t wait to win or buy one!!! As a public school teacher who is now at home with three little ones, I’ve never thought about homeschooling until I came across your blog this week. It was my search for seeing how real families ate whole foods that led me to your blog. God is good as he’s beginning to make major changes in my heart about what He is calling me to do right now in regards to my family. Homeschooling is one of these possible changes that I’ll be praying about this year as kindergarten approaches in one year. I’m excited to see your book! This would be perfect for my 3 girls. Thanks for sharing this with us! This would be so great for our home school this year! Thanks for putting it together! This looks wonderful. I would love to win a copy. So proud of you! That verse about “He who began a good work in you….” is coming to mind. I love that you created this to do with your kids. I have a 4 year old, almost 3 year old and almost 5 month old, and one of the most enjoyable things for me with “homeschooling” is coming up with our schedule/curriculum/arts and crafts/games, etc. It’s time consuming, but there’s nothing like seeing your son so captivated by a little homemade shape puzzle you made the night before. Congrats! I am SO interested in this! We do letter-of-the-week too but not like that! What a great idea. I think this sounds amazing! I recently have been considering homeschool as a possibility for our family. What an amazing tool and blessing this would be for our family! I am Grandma to 12 GRANDS, 6 who are preschoolers. I think your curriculum looks AWESOME!! Two of our three children are homeschooling their children. I would love to win this give-a-way to share with them. It is so special that you have incorporated learning to serve others into learning the alphabet, etc. My grandchildren really need your curriculum!!!! Thank you for this wonderful give away. would love to win one as i’m co-schooling two pre-schoolers in the fall with a friend. this is PERFECT! Wow! Amazing and congratulations! I would love to win this as I’m beginning to homeschool my 4 kids under the age of 5. I would love to have one of these! And winning it would be great! This looks like a great way for us to start out in our homeschool journey! I would love to win this. Thank you for always sharing your stories and your experiences, It has help our family so much! I would love to win this. I’m starting Kindergarten with my daughter and this would be a great addition to what we are doing! Congrats on your new e-book! I would love to use this with my little girls! I would love this! We have four children five and under, so this would be great! planning to homeschool, would love to get this book! It sounds perfect! I have 3 little boys so this would be perfect to have! I’d love to win!! Good work Laura! Thank you! This really sounds amazing – would love to try – thank you! I would love to win this to use for my three young boys! AMAZING, Laura!! I would love to win this to use with my 4 little ones!!! This is a GREAT idea – thank you for taking the time to put it all together!! We have a preschooler and another on the way, and we’re always talking about ways we can show them how to serve others as they grow! New to your blog – can’t wait to explore it more! On the lifetime of learning journey with 4 little blessings (so far:-) age 6 and under. I’d love to use your e-book with them! I’d love to win this. I am about to begin year 3 of homeschooling! My oldest will be in 2nd grade and my youngest is 4. I am so very grateful for my two year old, Lincoln and my husband. Your blog has really inspired me. Thank you for all your hard work. I am looking forward to you new ebook! It sounds amazing. This would be such an answer to prayer! I have been looking for some new curriculum!